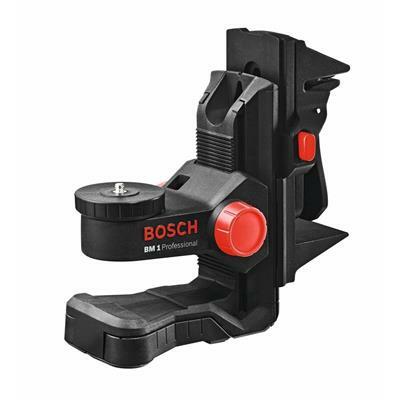 BOSCH BM1 Positioning Device for Line and Point LasersUse the BOSCH Positioning Device for Line and Point Lasers as a mounting base to set different alignment points for various laser tools, including Bosch's self-leveling lasers. Laser tools attach easily to a 1/4-20-thread turn-screw mount. The positioning device then offers four ways to mount it and the laser to a fixed base. Side-retractable feet allow the device to be positioned on the floor. Strong magnets will mount it to metal objects. A screw plate lets it be mounted on a wall. A button-activated spring clamp will keep it attached to conduit or channels for drop-ceiling applications. The line and point laser positioning device also enhances leveling accuracy with a quick application adjustment knob that fine-tunes leveling position up to a height of 2-1/2 inches, and with a flip switch to lock the laser position into place after adjustment. The plastic positioning device is compatible with many Bosch self-leveling lasers.